The other day I received an interesting response to my answer stating that the Bible supports an approximate 6000 year history for the human race. This person didn’t dispute the Bible, only our interpretation of it, in disagreeing with my answer. The essence of his response was that since science has found what it considers to be persuasive evidence that contradicts the literal view of the creation account, then our traditional interpretation of the language in Genesis 1 has to be flawed. Now I’ve said before that I’m OK with an old Earth. In other articles I’ve shown how an old Earth and young civilization are entirely compatible with a literal interpretation of Genesis 1. (Read More) But in his view the old Earth includes animals and other life, some of whom later evolved into humans. I’m not OK with that because the Bible says that animals came along on day 6, same as man. Then he repeated that He’s not contesting the accuracy of Scripture, only man’s interpretation of it. Let’s set aside the fact that most of those thousands of highly educated, highly experienced, highly motivated, life-long scientists and thinkers are non-believers who don’t think the Biblical Creation account is even a remote possibility. We’ll consider only the believers among them, because they’re the ones who say that the Scripture is accurate, but our interpretation of it is flawed. For all the generations from the dawn of creation until the early part of the 20th Century, almost all believers accepted the Lord’s account of the Six Day Creation. So what is it that we’ve “misinterpreted” for all these thousands of years? All believers agree that ultimately God is our Creator. So the basic conflict between the differing views of our origin really comes down to the time involved. Evolution requires millions of years, but the Bible says the creation was complete from start to finish in 6 days. Now there’s only one sentence in the entire creation account that concerns time. Therefore the whole argument boils down to a claim that for all these generations we’ve misinterpreted one sentence. That one sentence, repeated 6 times, reads like this. Furthermore, within that sentence there are only three words that relate to time; evening, morning, and day. If there’s been a misinterpretation, it has to be in one of those three words. By the way, let’s address the Bible’s accuracy here in case you’re thinking maybe some words got changed along the way to cause our misinterpretation. According to Rabbinical sources, there are 79,847 words in the Torah, as the first five books of the Bible are called, made up of 304,805 Hebrew letters. Fewer than 2 dozen of these letters are in dispute, and then only for spelling differences. 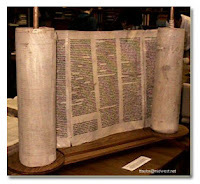 That means the Torah we have today is a 99.99% accurate copy of the one Moses originally wrote. We know this because every letter in Hebrew has a numerical value, so every line and every column of text has a correct sum. In hand copying the text every line was checked for accuracy by adding the sum of its letters and comparing it with the correct total. In the case of a difference, the page was destroyed, and the copyist started over. Remember, these people were entrusted with the very words of God and took that trust seriously. With that said, let’s take a look at the three words having to do with time. The Hebrew word for evening is erev. It’s always translated evening, sunset or night. The word for morning is boqer. There’s no question that it means morning. Hebrew speaking Jews greet each other at the beginning of each day with “Boqer tov” (good morning). And the word for day is yomn. As does its English counterpart, yomn can have a figurative meaning as well as a literal one. Of its 2287 appearances in Scripture, 2008 describe a literal 24 hour day. In the figurative sense it can mean a longer span of time, such as in the phrase "Day of the Lord" in Amos 5:18 where it refers to the 3.5 year long Great Tribulation. But common sense tells us that when combined with evening and morning, as it is in each of the six references of Genesis 1, it’s meant to be taken literally, a single 24 hour period, because there are no figurative applications for the Hebrew words erev and boqer. And the Bible doesn’t say there were evenings and mornings, it says there was evening (singular) and there was morning (singular). One of each. And that means one 24 hour day. We also have the first mention of the word day in Genesis 1:5 and it demonstrates the Lord’s intention for the word’s use. This verse established the way time would be reckoned. First there was evening, the beginning of the dark period, night, and then there was morning, the beginning of the light period, day. This cycle has repeated itself every 24 hours throughout history. Are we supposed to believe that for almost all of human history the words evening, morning, and day haven’t meant what people thought they meant? In an effort to reconcile the creation account with evolution, some believers try to give the Lord more time to do His work of creation. They call the six days of creation by a new name, “creation days”, implying that each one is more like an age than a 24 hour period. But the accepted meanings of the words evening, morning, and day don’t accommodate this dramatic stretching of time. The Hebrew language has other words for that purpose, so these words are never used to describe an age, especially when used together. I also realize that some believers don’t accept the Bible as being the word of God. They say it merely contains it. This allows them to discard parts of the Bible with which they disagree. Some discard the entire Old Testament, including the creation account, as little more than a collection of folk tales. But in Romans 15:4 Paul said that everything that was written in the past was written to teach us. In 1 Cor. 10:1-11 he cited a number of events from Israel’s history when the people rebelled and were disciplined. Then he said that these things happened to them as warnings for us on whom the fulfillment of the ages has come. And in 2 Timothy 3:16 he said that all scripture is God-breathed, or as we would say, written under the inspiration of the Holy Spirit, and is useful for teaching, rebuking, correcting and training in righteousness. In all these cases he had to be referring to the Old Testament, since the New testament didn’t exist yet. Who are we to dispute this and ignore his warnings? The Old testament is the inspired Word of God, just like the New, and is meant to play an important role in a believer’s life. But between the liberal denomination I grew up in and the public schools I attended, evolution was the only explanation of our origins I ever heard until I was well into adulthood. Sure God was our creator, but evolution was the way He did it. Nobody I knew thought to even question it. It wasn’t until I was born again at age 40 that I heard any teaching about the Creation, and then it was something I had to seek out for myself. I’m sure thousands of you had similar experiences growing up. In the last 100 years or so, a heresy called the documentary hypothesis has infested liberal theology. This hypothesis makes the claim that Moses didn’t write the Torah, but that it was pieced together long afterward from writings by several unrelated groups. Proponents of this view ask us to ignore the fact that Moses is mentioned by name in 85 verses of the New Testament, and that among them are multiple references to his authorship of the 5 Books of the Torah, including direct quotes from the Lord Himself. Was Jesus unaware of the real authors of these passages He quoted? Was he just going along with a tradition He knew was false, or did He know that Moses had written them? As you can see, these reasons for denying the 6 day creation won’t stand the test of rational thought. They’re just excuses people use to disregard the truth. Most scientists don’t say, "Our science is based on universally accepted assumptions, and yet our findings disagree with the Creator’s account of what He did. Our assumptions must be incorrect." I can understand non-believers searching for an alternative to the Biblical account. They have to find one in order to justify their disbelief. But how can scientists who are Christian actually think man can know more about how we were created than the One who did it, to a point where they can dispute the accuracy of the Creator’s account? Until then I don’t believe we have the right to pick and choose what parts of His Word we want to believe. We certainly don’t have the perspective.